Just Mayo can keep its name, but the vegan mayonnaise substitute will have to change the labels on its product, according to a new agreement with the FDA. 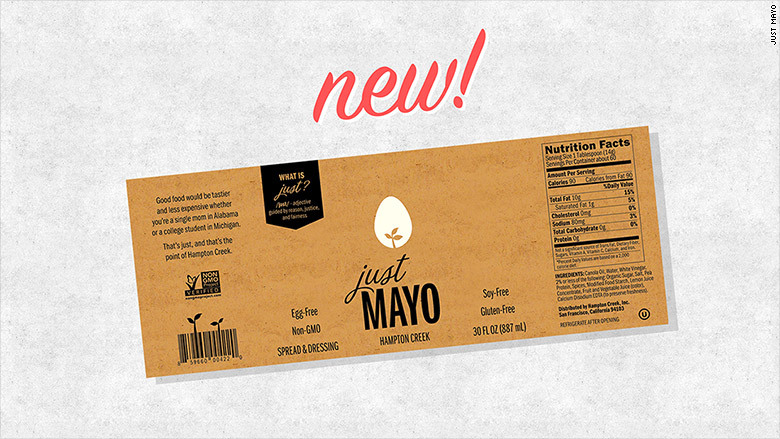 In August, the FDA issued a warning that told Hampton Creek, which makes Just Mayo, it could no longer call its product "mayo" when it did not contain eggs. Mayonnaise is a standardized food, according to the FDA, that by definition must include eggs as an ingredient. After months of negotiation, Hampton Creek has agreed to make some changes to its packaging but not its name. A new Just Mayo label will include a definition of the word "just" on the front of the product ("Guided by reason, justice, and fairness.") and have more context on the edge of the label. The Just Mayo logo, an image of a white egg with a pea shoot growing inside, remains but will be much smaller. The words "egg-free" will be larger and higher up, and a line that says "Spread and Dressing" will be larger and in all capital letters. Hampton Creek ordered the new labels on Wednesday and said they'll start appearing on shelves in 60 days. "The common ground we found with the FDA reflects an interest in people all agreeing we shouldn't have a crappy food system," said Hampton Creek CEO Josh Tetrick in a statement. "I've always felt pretty strongly that if we keep focusing on why we started the company, which is to do something positive through food, good people find a way of coming around." The FDA has not yet commented on the agreement. Just Mayo is sold in major chains including Whole Foods (WFM), Safeway, Target (TGT), Walmart (WMT) and Costco (COST). It's one of the 35 products Hampton Creek makes. The San Francisco company, started in 2011, says its focus is on making sustainable, healthy food that is also affordable. The decision is the latest in a string of dramatic events for the company. Last year, Unilever (UL), maker of Hellmann's mayonnaise, sued Hampton Creek for false advertising. It later dropped the suit. In October, The Guardian uncovered emails in which members of the American Egg Board, an egg lobby supported by the U.S. government, targeted the company and discussed ways to bring it down. Alerting the FDA was one idea. Another email included a joke about putting a hit on Tetrick, the newspaper reported. Tetrick thinks that, for now, the mayo drama is over. "I think we might have reached the conclusion here. I hope it's the beginning of more policy changes in food though."